A Pedestal Display Set is an ideal way of improving your visual merchandising. 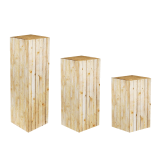 The set comes with three different size wooden pedestals so you can display your products at different heights for better visibility. What are the exhibition plinths made from? Each display pedestal is manufactured from dependable 18mm MDF (Medium Density Fibreboard). How do I assemble the Pedestal Display? We supply the set fully assembled. This is because each plinth is already glued and dowelled, so you can immediately put them in place. How can the Pedestal Display Set be used? The Pedestal Display Set is great for exhibitions, or for putting on displays at various events. 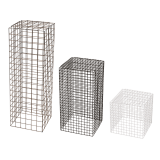 These are also perfect for use in museums and stores for placing goods on display. As there are three different size wooden pedestals, these can be placed in different positions to catch the eye of anyone walking by. How many plinths are there in each set? The set comes with a pack of three exhibition plinths. Pedestal one 30cm x 112.5cm x 30cm 11.81" x 44.29" x 11.81"
Pedestal two 30cm x 75cm x 30cm 11.81" x 29.53" x 11.81"
Pedestal three 30cm x 37.5cm x 30cm 11.81" x 14.76" x 11.81"
Pedestal one 40cm x 112.5cm x 40cm 15.75" x 44.29" x 15.75"
Pedestal two 40cm x 75cm x 40cm 15.75" x 29.53" x 15.75"
Pedestal three 40cm x 37.5cm x 40cm 15.75" x 14.76" x 15.75"